The National Museum of American Jewish History is OPEN and PAY-WHAT-YOU-WISH in celebration of Presidents’ Day on Monday, February 18, 10 a.m. – 5 p.m. Celebrate the founders and fathers of our nation by exploring the challenges and blessings of freedom, religious liberty, and equality for all people. Special Russian-language tours of the Museum will be offered at 11:30 a.m. and 2 p.m. No advance tickets are needed, but space is limited to 15 people per group on a first-come, first-serve basis. Museum of American Jewish History established in 1976, and situated on Philadelphia’s Independence Mall, the National Museum of American Jewish History is the only Museum in the nation dedicated exclusively to exploring and interpreting the American Jewish experience. The NMAJH was originally founded by the members of historic Congregation Mikveh Israel (established in 1740 and known as the “Synagogue of the American Revolution”). The Museum has long been a vital component in the cultural life of Philadelphia. During the course of its history, the NMAJH has attracted a broad regional audience to its public programs, while exploring American Jewish identity through lectures, panel discussions, authors’ talks, films, children’s activities, theater, and music. The Museum has displayed more than a hundred exhibitions in its first three decades-plus of existence. 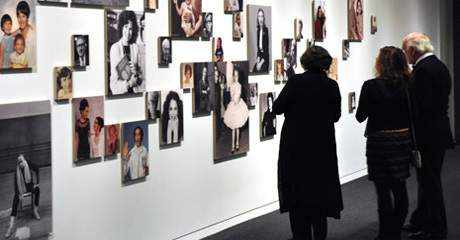 As the repository of the largest collection of Jewish Americana in the world, with more than 25,000 objects, the NMAJH has developed extensive institutional experience in preservation, conservation and collections management supporting the fulfillment of its mission to preserve the material culture of American Jews. By focusing on the particular experiences of one ethnic group and its relationship with the larger society, the Museum illuminates ethnicity in American life. Its location at the birthplace of American liberty is ideal for an institution that celebrates the freedoms that have made it possible for Jewish Americans to flourish. 101 South Independence Mall East, Philadelphia.